Twitter – it’s a hot topic these days. It can be used for customer service, entertainment, politics and even help communicate messages during disasters. The president uses it, the news outlets use it, but is it really ideal for your business? So, what is Twitter? Twitter and ‘tweeting’ is about broadcasting daily short burst messages to the world, with the hope that your messages are useful and interesting to someone. Twitter has 328 million monthly active users and is largely used in the 25-34 age demographic, with ages 35-44 right on its tail. Twitter’s big appeal is how fast you can share information and scroll through your feed: you can track hundreds of interesting tweeters, and read their content with a glance. The most IMPORTANT thing to remember is that this is a relationship builder. Social media, twitter included, should never replace the art of conversation. It simply enhances it on a digital level. We will discuss twitter for businesses in a different blog, but first let’s talk about the fundamentals. Each platform has their own unique language. Twitter is no different. Tweet: A Tweet is an update posted on Twitter. It can contain text, photos, links, GIFs, and videos. 140 characters or less. Reply: Click ‘reply’ to respond to a Tweet. Replying to a Tweet shows that you’re listening and engaged in the topic. Retweet: A Retweet shares someone else’s Tweet with the people who follow you. Retweet as is, or quote to add commentary. Like: A like is a simple way to positively acknowledge a Tweet. It can also be useful to use as a bookmarking tool if you want to easily find a Tweet again. Tap the heart icon to like a Tweet and the author will see that you appreciate it. Hashtag: A hashtag is any word, or phrase without spaces, beginning with the “#” symbol. People add hashtags to Tweets to link all the content related to a given topic. Click on a hashtag to go directly to the search results for that term. Hashtags that become very popular are often “Trending Topics”. Mention: Bring a Tweet to another person’s attention by including their @name in your message. You could use it to ask someone a question, to thank them, or simply to highlight a piece of content. 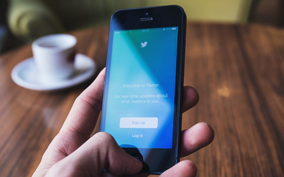 With Twitter, you may be wondering if Twitter is appropriate for your business to use. We’ve covered some basic terminology today to help you better understand how Twitter works. Things to consider: If you plan on tweeting once a day or semi-regularly – it’s likely not often enough. Tweets do not hold legitimacy in the Twittersphere for more than 24 hours. You want to evaluate your audience: what are their ages, locations, interests – do they use Twitter? Gather that information and use that to determine which platforms your business should use.